It’s Beginning to Cost a lot Like Christmas – #DoubleFML FatDarrellPalooza! Hey what’s up everybody! Welcome back to #DoubleFML FatDarrellPalooza! Last post, so many people came to the defense of my ugly hoodie (see my definition of the ugly/pretty threshold as explained last post by clicking here) so I figured I’d just go ahead and double down on the ugly this week with that outfit in the cover photo! Don’t worry, no Muppets were harmed during the making of this sweater. Let’s see if anyone defends this one! And if the sweater isn’t ugly enough for you, I’ll see you that and raise you one with this ugly long sleeve-tee! Oh, wait, actually here’s another one! If any of you saw my appearance on Travel Channel’s Extreme Pig Outs, you may remember the ugly red blazer that I had on during the episode (if you missed it or just want to watch again, check out our Media Archive by clicking here). Anyway, wow, these days are really flying by. December is in full swing! I haven’t even bought one Christmas present yet (at least not for anyone aside from myself) so I definitely need to hurry up and get started asap! Oh yeah, for those of you who are wondering about the update from last post, no, I haven’t dug out my tree yet. I have let a few Christmas songs play all the way through on the radio though which is rare for me this early in the month, so there’s still a strong chance that I’ll actually decorate too! Speaking of Christmas songs, I actually had a mind-blowing discovery while writing this post! This may be common knowledge for many of you, but I had no idea that the gifts described in the 12 Days of Christmas lyrics were actually hidden references to components of the Christian bible. In hindsight, I probably should have figured that out ages ago, but no, less than 24 hours ago I still thought that the song was written by a demented rich sugar daddy or something! Seriously, taken at face value, these gifts are a bit strange to say the least! In case you forgot the words, see for yourself! And next to each line were my unintentionally blasphemous initial thoughts (lol whoops!) prior to my discovery. The metaphors seem fairly obvious now but on the surface, those are some strange gifts! It would be even more bizarre if you didn’t know that more were coming. I mean, on day 8, some weirdo just shows up at your house with a bunch of milk maids? Huh? Um, yeah, I hope you kept the gift receipt for that one buddy. Oh yeah, and while we’re on the subject of Facebook, my friend LJ sent me a video featuring a new refrigerator on wheels from Panasonic that will come to you when you call it! Seriously, they’ve developed robot technology so that when you tell it to “come to the living room” for example, it will roll itself over to you! I know that I have a wild imagination but I’m honestly not making this up. How cool is that? I’d probably break that thing within a day with as many times as I’d call for it. I’d probably just take it with me everywhere. I’d be walking down the sidewalk with the fridge rolling beside me. Hey, you never know when you might have a snack emergency so it’s better to be safe then sorry right? They’ve also come out with a dryer that folds the laundry itself too! As cool as these items sound though, this is literally how all of those “robots take over the world” sci-fi movies start so we’ll see how this plays out! Anyway, I really do wish that I had that 12 Days budget because man, 2017 is going out with a bang! It’s been one unexpected expense after another so a few of you family members reading this might be getting a high-five and a hug for Christmas this year! I’d never actually do that of course (although it’s the thought that counts eh? ), but I really have taken a few solid punches to my wallet these past few months! While I was cleaning up the other day, I spotted a few items that I’m planning to sell online to give my account a little boost. If you to take similar action, I recommend meeting your potential buyers at a public place instead of giving them your address. You never know these days so playing it safe beats having some psycho stalker show up at your house for the next 12 days with 4 birds, 3 hens and 2 doves for example. Oh yeah and then I finally got my refund for that T-rex costume that I showed you in my Halloween post that was shipped to me with a hole in it! I also remembered that I have a few large jugs (that’s what…nevermind) full of coins that I plan to roll and bring to the bank as well. Yes, I’m rolling them myself because I’m still scorned after I learned that “Penny” had been cheating for all of those years. “Who is Penny” you ask? Penny was the little mascot on the coin exchange machine at TD Bank back in the day. She’d smile and giggle as you dumped your coins in. It was cute…until a report came out years later that the machine was rigged to take more than the 7% that I thought it had been taking! So yeah, now I have trust issues. “Fool me once”, right? Besides, with the amount of coins that I have, 7% is actually a decent amount of cash. Normally it would still be worth it to save the hassle of rolling the coins myself, but I found this cool sorter on Amazon that makes separating the coins nearly hassle free. You just stack the trays, pour a handful of coins in and shake it like your panning for gold or something. The smaller coins keep dropping down through the trays until they’re all separated. It’s pretty brilliant actually! If you want your own, click here to check it out on Amazon via our affiliate link (you pay the same low price either way, we just get a commission for referring you). Despite my recent budget concerns, when I learned about this amazing regional restaurant chain, Grub Burger, I was all-in. Hey, #yolo right? Besides, this place has been getting rave reviews online so when I happened to be near their Brookhaven, GA location, it was definitely time to check it out and see what all of the hype was about for myself. I got the Mac and Cheese Burger with sweet potato fries. Yes, you guessed correctly, it was loaded with macaroni and cheese (and bacon!) and yes it was delicious! My friend Nicole was equally impressed with the meatless Hippie Chickpea Burger made from chickpeas and eggplant. They also have salads, sides, sandwiches, bowls, milkshakes, pies and a partridge in a pear treeeeeeee (okay, not that last one but everything else). They’re currently only in California, Delaware, Florida, Georgia, Louisiana, Pennsylvania and Texas but if you’re near one, it’s definitely worth the trip! For more information, check out their website by clicking here. So while we’re on the subject of food, remember last post how impressed I was with my little nephew’s foodie Christmas ornaments? Regular readers should know that it wouldn’t be me if I didn’t go look for these myself too! Ha, these are awesome! Sushi? Sandwiches? pancakes? Pasta? If you’re planning to start going to a gym or change locations, now is the time to look! As a fitness professional for nearly 20 years, I can say without hesitation that your best deals are likely to start popping up now. Although January is when the rush of new people flood the gyms to start their resolutions and burn off the extra weight gained over the holidays, most gyms try to lure you to their locations with deep discounts much earlier in hopes that you’ll choose them over the competition. Some promotions may run through January but now is still the best time to start your comparison shopping and possibly save even more since this is the peak gym membership sales season to close out the year. Whether you’re switching gyms or working out at home, remember that you don’t have to wait until January to start working toward your goal. So start now and keep going strong in 2018! Do you have a fitness question you’d like answered or an accomplishment you’d like to share? Tell us about it in the comments below! Do you have another song that fits today’s themes? How about a song that doesn’t fit but is just so good that we should check it out anyway? Tell us about it in the comments below! Besides mourning my account balance, today was also a sad day because it’s the end of an era. Yes, many years ago, my nephew DJ and my niece LaNaya gave me this Sponge Bob stationary that I’ve used to write my daily to-do lists for as long as I can remember. Today however, I have reached the bottom of the barrel. Literally. It was the last page. I feel bad using it so instead I will just archive it as I contemplate what design to replace it with going forward. And while I have a lot of jokes about holiday spending, let’s obviously keep things in perspective and remember that it’s not all about the money. No matter your belief system, this entire month is really about coming together with friends and family and caring for others. The presents are just an added bonus. Anyway, before we close this one out, please remember to post a comment below before you leave and also make sure to follow me on social media by clicking the icons on the side panel. December 5th?! 20 more days….yikes. All good. I love pressure. This time of year makes me smile, lots to do, people to visit, and giving to those who can’t give anything but love back. What a way to start my day!!! Darrell, you crack me up with your humor. What can I say? Santa Darrell is hilarious hohoho!! The red blazer is awesome. Are those red shoes? Love them!! They are “the bomb!” I am now in the holiday mood and I think I will decorate today….hint, hint! Ha, thanks Rebecca, I’m glad that your day got started off with a smile. That was the goal of staring this page, to create an escape and make people smile so mission accomplished. Ha, those red shoes were from my nephew DJ by the way so blame him if you hate them! Great post! Love all of those pics and food ornaments. Santa Darrell blew me away!!!!! You played some Christmas songs already? That’s a great start…… I am curious about the refrigerator on wheels! Not sure that’s a good idea for “greedy people,” or should I say people who love to eat? I do not recommend that your buy one!!!! lol That Mac and Cheese Burger with sweet potato fries looks plentiful and “super delicious!!!. Not sure about the Hippie Chickpea Burger, but it looks good. Hey, don’t get too excited, I accidentally stumbled across a Christmas song on the radio and I let it play instead of changing it immediately. Baby steps eh? And you’re right, that fridge could be dangerous! Hmm, in hindsight I should have tried her Hippie Chickpea burger too – it actually looked really good! Plus it’s made from eggplant so that’s already pretty awesome. I’ll have to check it out next time! Love this post!!!! !I had no idea that the 12 days of Christmas song contains hidden references to components in the Christian Bible. This is so awesome!!! Thanks for this revelation….I am going to emphasize this when I share this post with others!!!. Might have to hire you as Santa at my next Christmas promotion venue. hohoho!!!!! Hilarious post, never a disappointment. More importantly, as a practicing Catholic, I never knew the meaning behind 12 days of Christmas. Snopes.com broke it down for me. Lastly, I found this hoodie that needs to be in your holiday rotation. Put it on your wish list. Sending you mucho amor, besos, y abrazos. Merry Christmas! Ha, I’m actually not mad at that hoodie lol I’d wear it! I’m glad that I’m not the only one who had no idea about the double meaning! I had literally finished this entire post when I went back to check something and found out for myself as well! I’m glad that you’re entertained by the posts and thank you for commenting, I appreciate you! lol why did you almost get kicked out? Ha my bad but yes I’m glad I’m not the only one who didn’t know this info! Thanks for sharing some of your hilarious outfits with us. “Go Santa!” lol Christmas is definitely rapidly approaching and the expenses are mounting…so we all need to click on your Amazon referral site to get the best deals ever!!! I am going to check out that coin sorter as a stocking gift for others to help them manage their coins!!!! Ha thanks! I’ll let him know! Pingback: Ice Ice Baby Too Cold – #DoubleFML FatDarrellPalooza! Pingback: Kick Rocks 2017 – It’s the #DoubleFML Year End Special! – #DoubleFML FatDarrellPalooza! Pingback: Mr. Breakfast Did it all for the Cookie – #DoubleFML FatDarrellPalooza! Pingback: Varsity Blues: Peachy…just peachy. – #DoubleFML FatDarrellPalooza! Pingback: Keepin’ it 100 – #DoubleFML FatDarrellPalooza! Pingback: Food Swings – #DoubleFML FatDarrellPalooza! Pingback: Party Time! Excellent! – #DoubleFML FatDarrellPalooza! 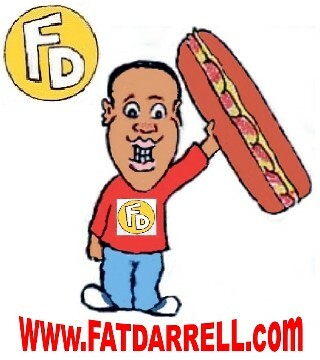 Pingback: Flashback Time Machine: Pon de Replay – #DoubleFML FatDarrellPalooza! Pingback: Hashtag Blessed: Still Giving Thanks – #DoubleFML FatDarrellPalooza! Pingback: HOx3 – #DoubleFML FatDarrellPalooza! Pingback: Fra-Gee-Lay: How Kojie and Fat Darrell Stole Christmas – #DoubleFML FatDarrellPalooza!